I am all about investigating the best ways to prepare food in order to optimize digestion and its nutritional value. When you soak oats overnight, their digestibility improves, as their starches break down and natural phytic acid is reduced, making them more easily absorbed by your body. The soaking is similar to cooking it for a long time over a low heat, and you won’t deplete them of their nutritional value as you would by cooking at a high temperature or placing them in a microwave. In addition, resistant starch is a natural type of carb found in starchy foods. It miraculously helps decrease insulin levels that can spike when eating hot, cooked starchy foods (more likely leading to weight gain). This type of starch is found in foods that are slow-cooked or cooked and then cooled. Some people allow their grains, potatoes, or beans to cool before eating them to increase the resistant starch. Phytic acid is found in all whole grains. In large quantities, it may lead to compromised mineral absorption due to the fact that it binds these minerals, which then are eliminated in feces. Soaking grains in warm water, as well as sprouting them, activates an enzyme called phytase, which will break down the phytic acid. One problem with oats (and also some other grains such as corn, millet and brown rice) is that they do not contain enough phytase to neutralize the phytic acid, even if soaked. This is why many people may think that they are experiencing bloat due to the gluten, when that’s not the case! Soaking your oats with another grain that contains more phytase is beneficial for that reason. Wheat, rye, and buckwheat all contain significant phytase. You are also best off soaking with warm water or almond milk, since cold temperatures inhibit activity of the enzyme. Bacteria can also break down phytase, so soaking your oats with probiotics such as kefir or plain greek yogurt can also further help break down phytic acid. Sprinkling some cinnamon on your oats will also help with digestion! Remember to choose organic, old-fashion rolled oats. Gluten-free options exist and can help even more with digestion! Rolled oats are higher in fiber than instant or quick cook oats, which is optimal for sensitive tummies, cuts down your net carbs and you will stay full for longer. I use no more than 1/3 a cup of oats at a time, as it’s all I need to feel satiated! Organic oats are also a smart choice due to having a reduced amount of pesticides or chemicals which also can cause stomach irritation. 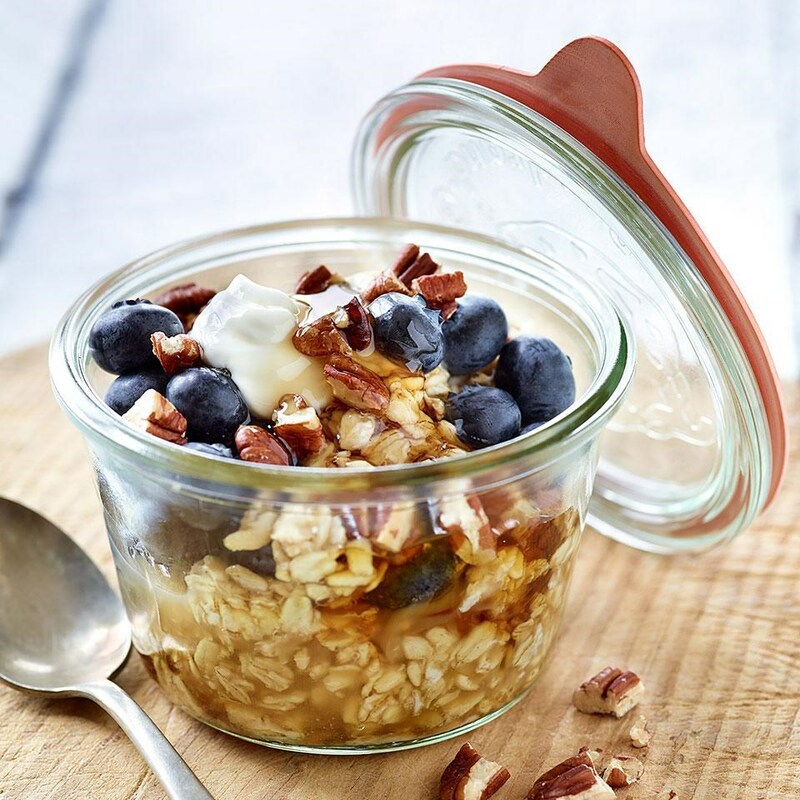 The best part about overnight oats though has to be that it is just so easy to make them. And, when you have time in advance to prepare your oats (such as the night before), rather than rushing in the morning…. you can get creative! Additional tips: Always eat your oats with a healthy fat like grass-fed butter, coconut milk or coconut oil. The fats are necessary for us to absorb the fat-soluble vitamins in grains. I recommend the full fat version of whatever yogurt you use for this reason as well! Also- Never buy your oats from the bulk bins. You want them in a sealed package, so that the oils don’t go rancid and cause free radicals in the body. Once everything is mixed together, add in almond milk until it sufficiently covers the ingredients. In a small bowl, add wet ingredients and blend together until you get a creamy consistency. Add wet ingredients to dry ingredients and stir. Cover mason jar or bowl with a lid or paper towel. Allow to set in fridge for 24 hours. Leave pecans to soak overnight in purified water with a pinch of sea salt.